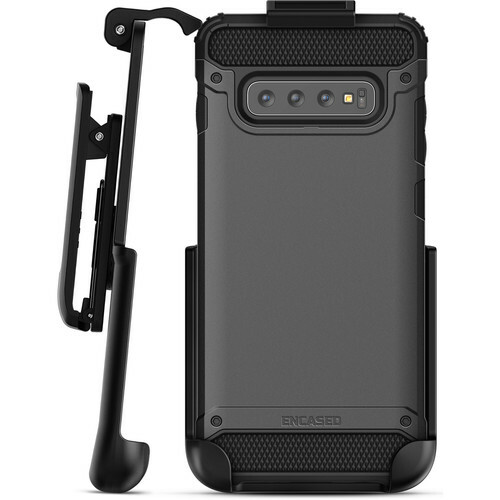 Keep your Samsung Galaxy S10 protected and within reach with the Scorpio Series Case with Belt Clip Holster from Encased. Designed to exceed military impact standards, this case has been 10' drop tested and certified to protect your phone from bumps and drops. With its scratchproof housing and shock-absorbing lining, this case effectively diffuses shock energy away from your device before it causes damage. This Scorpio Series case also has a raised lip guard, which is designed to keep the screen elevated and scratch-free if you place your S10 face down on a flat surface. The included belt clip holster attaches to the Scorpio case and allows you to clip it and your device to your belt. This holster is designed for durability with a solid-core polycarbonate frame, non-slip rubberized grip finish, and a soft microfiber lining. Additional features include a rotating vertical or horizontal design to match your preference, full port and button cutouts for easy access, and a built-in kickstand for convenient hands-free viewing. Box Dimensions (LxWxH) 9.0 x 4.8 x 1.5"